Steven James Grogan (born July 24, 1953) is a former American football quarterback. He played in the National Football League (NFL) for sixteen seasons and spent the entirety of his career with the New England Patriots. An agile, durable dual-threat quarterback in an era known for pocket passers, he led the league in both passing and quarterback rushing statistics several times in his career, and ran for a quarterback-record 12 touchdowns in 1976, a record that stood for 35 seasons. Grogan ran for over 500 yards in 1978 and led the team to an NFL record 3,156 rushing yards, still an NFL record for rushing yardage by a team. When he retired in 1990, he held many of the team's passing and longevity records, though most have since been broken. He was inducted into the New England Patriots Hall of Fame in 1995, and currently owns a sporting goods store in Massachusetts. For the Patriots 1976 season, Grogan led the Patriots to an 11-3 record and the franchise's first playoff berth since 1963. The eleven wins were the most Patriots wins in a season since the club’s inception. Along the way the Patriots defeated the defending Super Bowl champion, Pittsburgh Steelers (30-27). They also handed the Oakland Raiders their only regular season loss that year by defeating them 48-17. However, they lost the divisional playoffs (24-21) to the Raiders. Grogan scored 12 rushing touchdowns in 1976, breaking a quarterback record of 11 previously held by Tobin Rote and Johnny Lujack. His record would stand for 35 years until broken by Carolina Panthers quarterback Cam Newton's 14 in 2011. In the Patriots 1978 season, Grogan led the Patriots to an 11-5 record, a division title and the organization's first ever home playoff game, a 31-14 loss to the Houston Oilers. The Patriots set the all-time single season team rushing record with 3,156 yards (Grogan rushing for 539 yards and 5 touchdowns himself). That record still stands as the most productive rushing team ever in the history of the NFL. It is also the only season an NFL team has had 4 players rush for over 500 yards apiece. At the time of his retirement, Grogan led the franchise as the all-time leader in passing yards (26,886) and passing touchdowns (182).As of 2019, he is ranked third in passing yards and passing touchdowns behind Tom Brady and Drew Bledsoe. His 16 seasons are the second most ever for a Patriots player, behind Tom Brady. He also held the Patriots previous single-game record with a 153.9 quarterback rating, achieved by completing 13-of-18 passes for 315 yards with five touchdowns and no interceptions against the New York Jets on September 9, 1979, before Drew Bledsoe posted a perfect 158.3 rating against the Indianapolis Colts on December 26, 1993. Grogan rushed for 2,176 yards (4.9 per carry) and 35 touchdowns during his career, a mark which places him as the Patriots' fourth overall in rushing touchdowns. With Grogan, the Patriots made the playoffs five times (1976, 1978, 1982, 1985, and 1986 as a backup). Before Grogan was drafted, the Patriots made the playoffs just once from 1960-1974. Grogan's injuries and his toughness in response to them are also part of his legacy. One sports writer for the Boston Globe, wrote of the "Grogan Toughness Meter" in 2003. The writer, Nick Cafardo, gave a partial listing of Grogan's injuries over his 16-year career: "Five knee surgeries; screws in his leg after the tip of his fibula snapped; a cracked fibula that snapped when he tried to practice; two ruptured disks in his neck, which he played with for 1 1/2 seasons; a broken left hand (he simply handed off with his right hand); two separated shoulders on each side; the reattachment of a tendon to his throwing elbow; and three concussions." After retiring from the Patriots, Grogan attempted to get a coaching job, but found that no one above the high school level would hire him. He was approached by the then-owner of Marciano Sporting Goods in Mansfield, Massachusetts (a business originally started by Rocky Marciano's brother Peter) to purchase the struggling business from him. Living only five miles from the store, and seeing it as a good investment, Grogan agreed to purchase the store, renamed it Grogan Marciano Sporting Goods, and continues to run the business today. Other than running his business, he also makes appearances at local businesses and civic organizations. ^ a b c Gill, J. (August 18, 2010). Boston sports, then and now: Steve Grogan. Boston Sports, Then and Now. ^ Harrison, E. (October 8, 2010). From Moss to Johnny U, these are the most impressive records. NFL.com. ^ a b c Zimmerman, P. (February 3, 1986). A brilliant case for the defense. Sports Illustrated. ^ Cafardo, N. (September 25, 2003). Brady inspires tough love. Boston Globe. ^ Crippen, Ken. 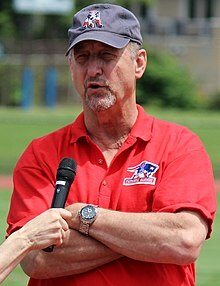 "Where Are They Now: Steve Grogan". National Football Post. NFP Media Group L.L.C. Retrieved March 7, 2019. ^ a b Haskin, K. (August 7, 2002). Kansas State will unveil a ring of honor at KSU. Topeka Capital-Journal. ^ Gill, J. (December 1, 2010). Patriots Grogan and Bledsoe caught in retired numbers game. Bleacher Report.